Last month Cirkle kindly sent me a 3 recipe kits to try. If you haven’t heard of this company, they are a grocery home delivery service providing organic and artisan products. As well as that, they offer a free recycling service, aiming to ‘make it easy to eat well and do good’, a philosophy I can wholeheartedly agree with. They have a wide range of products available; from fruit and vegetables to meat and dairy, lentils and pasta to baby food! Plus, they have a flexible, well-organised delivery service that enables you to find a day and time that will suit you. With the recipe kits, you can choose to purchase each individually, or opt for a set of 3 predetermined recipes in their recipe package. 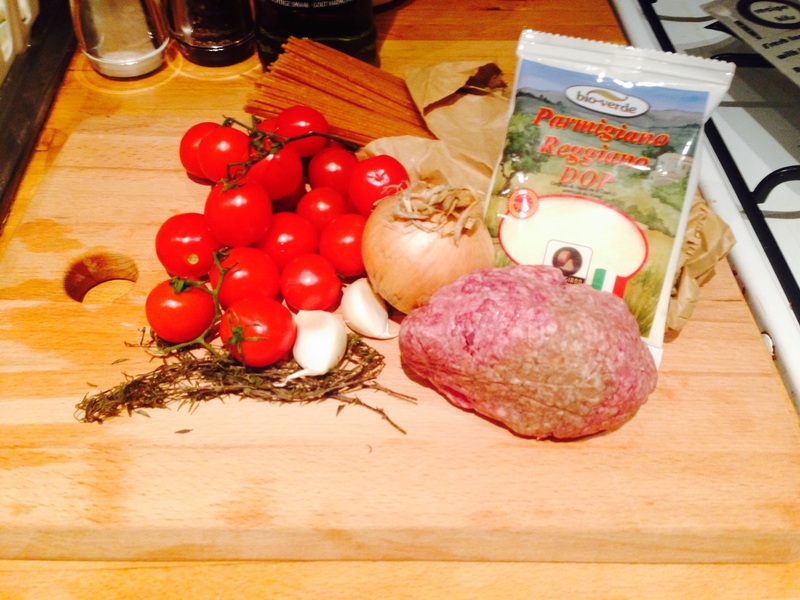 Each recipe comes for either 2, 4 or 6 people and the prices (for 2 people) range from €6.24 to €20.07 per recipe. The package, to include 3 recipe kits, are priced as follows: €39.99 (2 people), €69.99 (4 people) or €99.98 (6 people). Firstly, the picture doesn’t do this food justice, the colour on this fruit and veg is simply amazing. But, I must admit, at first I wasn’t sure about this recipe. I’ve actually not cooked fresh beetroot before (I was put off from my mum always trying to get me to try the pickled stuff) and…warm lettuce?! But actually, this ended up being my favourite recipe of the lot. 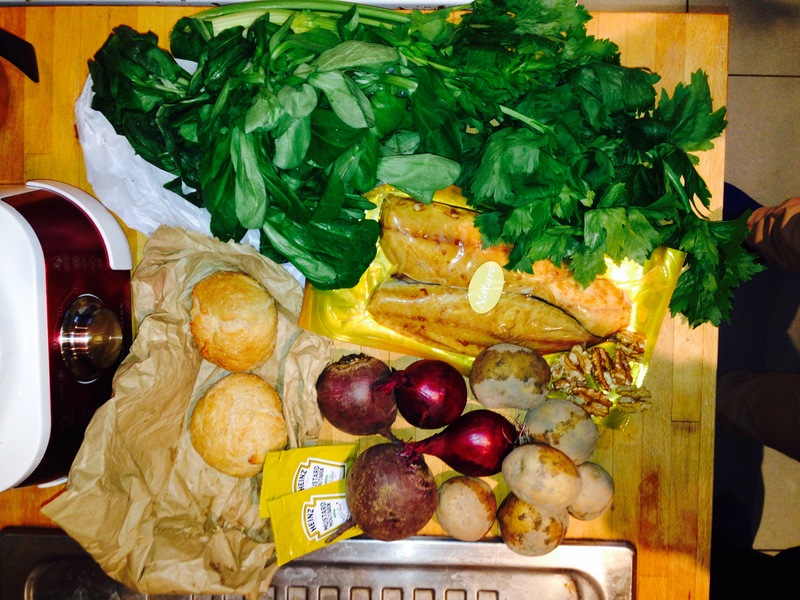 The smell as it was cooking was terrific, so mouthwatering, and the combination of colours looked appealing. On tasting, the different textures from the raw onion, soft potato and crunchy lettuce was fantastic (you let the warm stuff cool slightly so the lettuce doesn’t wilt). The comfort of the warm beetroot was complimented by the subtle flavour of the celery and the stronger smoked mackerel. It was, quite simply, yum. And I will definitely be cooking this again. 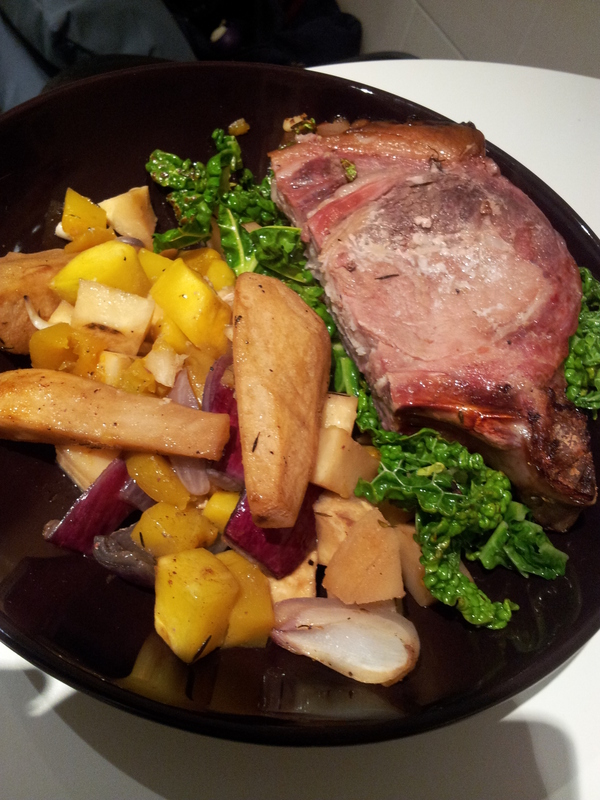 In terms of balance, there was plenty of veg *thumbs up*, and the meal contained a protein and potatoes as a starchy carb source – great! Also, mackerel is an oily fish, so good for poly-unsaturated fats and omega-3. My only consideration was that I personally didn’t feel that the bread was necessary, I felt that the potato was sufficient. Especially given that this actually did us 4 meals – we both had it for lunch the following day – bargain! This is a dish that sounded right up my street. Cooked using minimal equipment, and it contains some of my favourite vegetables and flavours. This recipe was very easy to put together, and the quality of the meat (sourced from Jack O’Shea) was obvious even before cooking. Again, the combination of flavours worked really well. 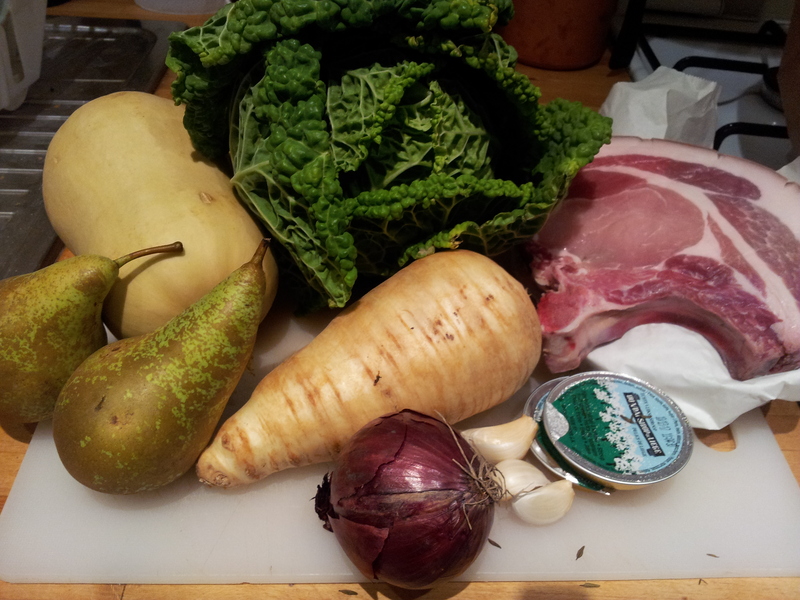 I love pear and parsnip and it was perfect with the pork, making a change from the usual apple. We used all of the ingredients except half the cabbage, and there was still veg left in our pot for an extra 2 meals….I could get used to this! I found this meal really satisfying, however, although you would be getting some carbohydrates from the vegetables, it does lack a source of starchy carbohydrate. It might also be worth tweaking the recipe slightly if you’re watching the amount of saturated fat in your diet, as cooking it all together means that the veg soaks up a lot of fat from the pork. All in all though? 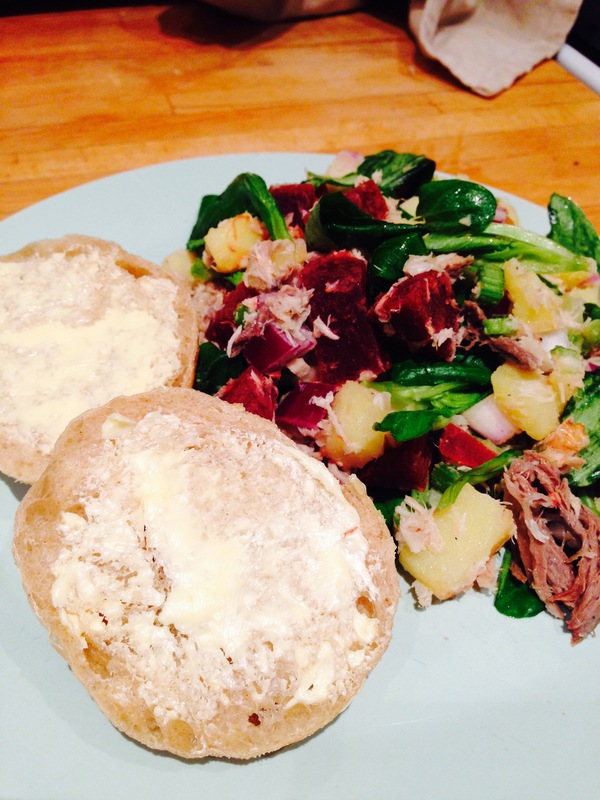 Another tasty recipe and I was loving all these leftovers! This dish is one of our favourites at home, and I usually don’t follow a particular recipe, so I was intrigued to try this one. Call me lazy, but I tend to use tinned tomatoes with a handful of fresh in my ragù, so it made a nice change, and I did notice the taste difference. As with the pork, the meat was of excellent quality and really added to the dish. This is also the best wholegrain pasta I have ever tasted! With this recipe, the portion sizes were just right for 2 people (although we did have some Parmesan leftover!) 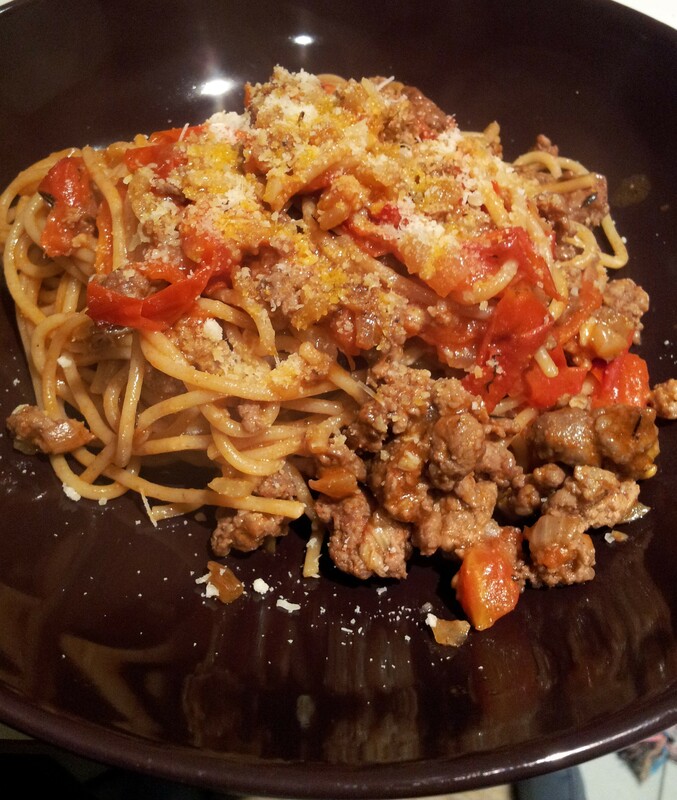 Wholegrain pasta is great for slow release energy and fills you up, and the minced beef is a good source of iron. I personally would add a bit more veg in there; to include some mushrooms, courgette, aubergine or bell pepper would boost the vitamin and fibre content. This recipe is definitely a good one for after a busy day, as it’s quick to prepare, filling and a true home comfort. Overall, I was really impressed with the quality of the ingredients, and the recipes all tasted really good. Cirkle offer loose products as well, and you can purchase fruit or vegetable boxes, but I think that the recipe kits are definitely worth a go if you find yourself lacking inspiration in the kitchen. Given the quality and quantity you get, I think that they work out really good value too! I will definitely be using them again in the future, and look forward to trying some more of their recipe kits. If you are one of my clients and want to give Cirkle a try…ask me about how you can get a free small fruit box in your order!